There IS a method to our MADNESS! Someone asked a couple of weeks ago.."Why all the ink on the sheep?" I chuckled as I realized they thought we'd gone mad with the paint branding. But really, there IS a method to our Madness. Notice the white Premise ID tag AND the white ID tag...can you tell when she was born? Summer and fall bring breeding season. We generally offer 5 AI days and 1 Flush day here at the farm. During cidr time, we paint brand the ewe's number on her side as seen above. This mostly serves as a purpose of us being able to better see the ewe's number from a distance. When we have large groups in the pastures with teaser rams, we can more easily spot the ewes number that is repeating and needs to be bred again. Rhett is one of three border collies we use on the farm. Finally, each ewe will be paint branded with a 1-2-3-4 or 5 on top of her shoulders. This correlates to the day in which she is scheduled to our AI breeding program. 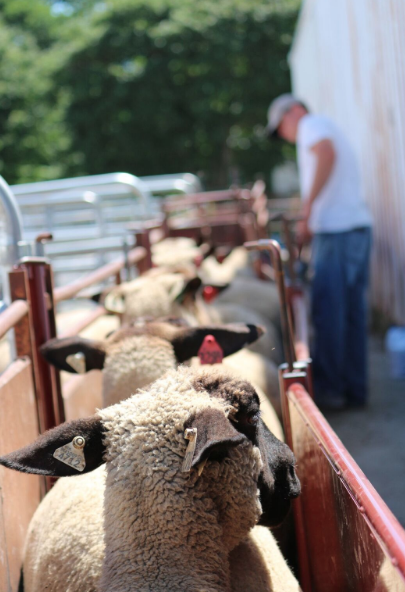 We typically run around 900 ewes through our AI program each year (500 being our own ewes). It is no minor undertaking to manage these large breeding groups. This helps us quickly sort off groups into one of 5 sorting pens. This may seem like overkill if you are running smaller numbers of ewes. However, we think we've developed a system that works for the Poe Farm. No doubt we will continue to tweak our system as we continue to grow. But for now, we'll stayed inked!